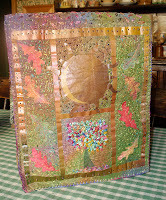 The woman in my Tree Books course asked me to design and make a box or bag to keep their books in. 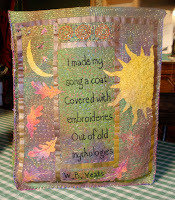 I decided to make a bag and have just finished the first one for the Oak book. The pictures at the top show the front, back and under the flap of the bag. Got lots of ideas for the next bag, for the Ash book. 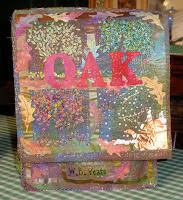 Will be offering the bags as a short follow-on course after the Oak and Ash Tree books in the next workshop programme. The next workshop programme will be out on Saturday 21st July. I hope to have lots of examples of the courses and classes in the Duffryn Community Centre, with a few of the tutors presents so that you can chat to them and find out more about the classes on offer. It's alway a popular day and Sue and I hope you will be able to come along.